PRESS RELEASE – Suicide is the 10th leading cause of death across all age groups. Those who need help, as well as their loved ones, do not always know where to turn or know what help is available. The disconnect between the need for help and the programs to help are now being brought together by a group of volunteers introducing themselves as “The Link”. Through their efforts, they will be “linking” services with those in need as well as planning fundraisers to promote suicide awareness and prevention. It is also their goal to open up the lines of communication to get people talking and stop the stigma associated with needing and asking for help. “The Link”…Make the Connection…Start the Conversation…Stop the Stigma. Back in the fall of 2012, the organizers held the area’s first Out of the Darkness Walk. Unfortunately, due to the organization’s policies that had not been fully disclosed before the event took place, profits from the event were not able to be used as originally planned. As of the spring of this year, the issue was settled and every school in Carbon and Schuylkill Counties received a copy of “More Than Sad”, a two DVD set. One DVD is More Than Sad: Suicide Prevention Education for Teachers and Other School Personnel and the other DVD is More Than Sad: Teen Depression. Please contact your school’s administration to view your school’s copy that they received earlier this year. 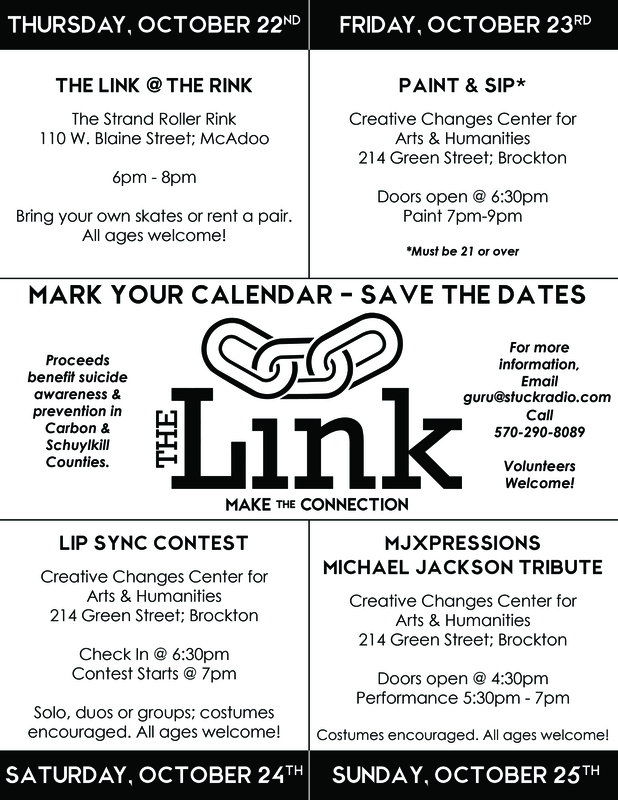 Now able to move forward with a new plan, “The Link” crew is planning four events back to back this month. Funds raised will be used in Carbon and Schuylkill Counties for suicide awareness and prevention programs. 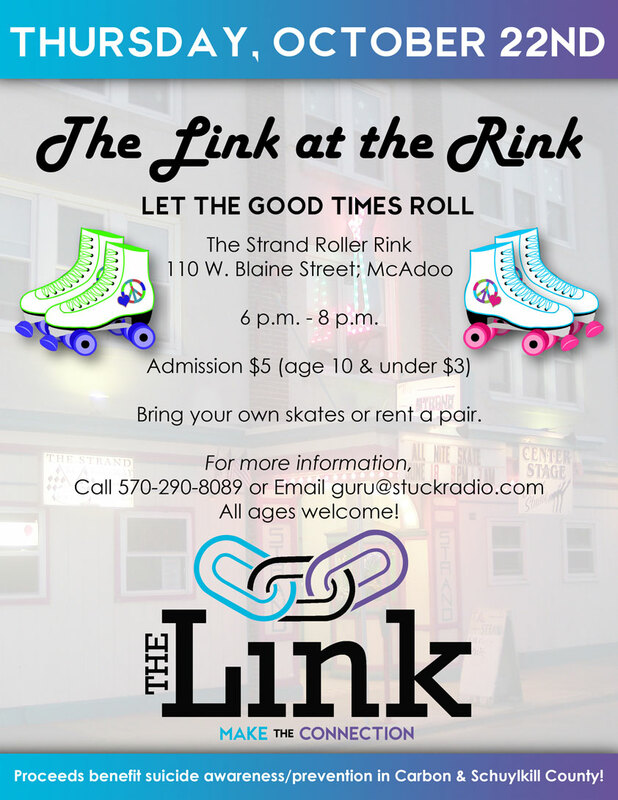 Events start with “The Link at the Rink” on Thursday, October 22nd at the Strand in McAdoo from 6 until 8 p.m. All ages are welcome. 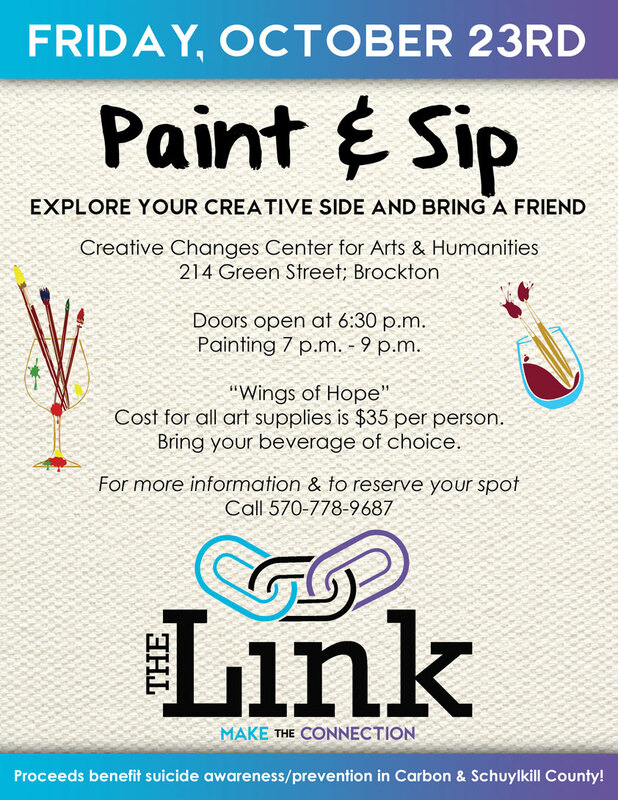 The next 3 nights’ events will all be held in Brockton at the Creative Changes Center for Arts and Humanities at 214 Green Street. Friday, October 23rd will be a Paint and Sip. 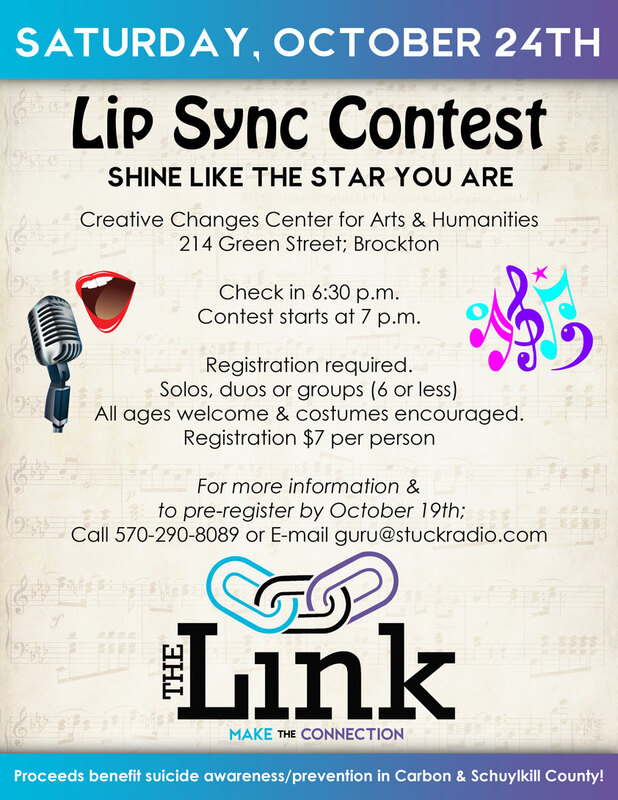 Doors open at 6:30 p.m. and painting is from 7 until 9 p.m. Saturday, October 24th will be a Lip Sync Contest with check in at 6:30 p.m. and the contest starting at 7 p.m. Solos, duos or groups (of 6 or less) of all ages are welcome. Pre-registration is required. 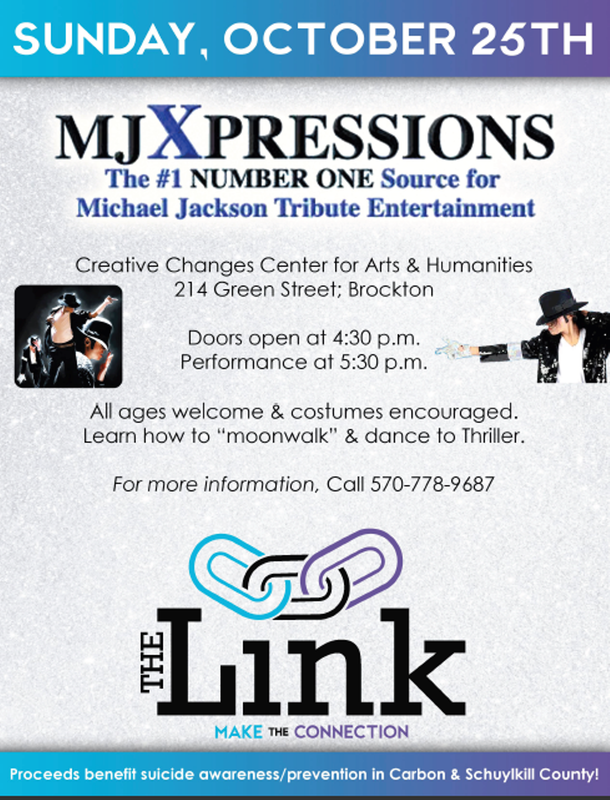 Sunday, October 25th will feature MJExpressions, a Michael Jackson tribute, with doors opening at 4:30 p.m. and the performance starting at 5:30 p.m. In November, they are also planning an ’80s Movie Night at the Angela Triplex Theatre in Coaldale on Saturday, November 14th with The Wedding Singer at 7 p.m. and The Breakfast Club at 9 p.m. Prizes and monetary donations are currently being accepted for all events. To donate, for more information or to volunteer, call 570-290-8089 or email guru@stuckradio.com. For more information, visit the group on Facebook at https://www.facebook.com/pages/The-Link/1496568213990966?sk=events.